This high-flying kitty activation toy has 3... Count 'em 1-2-3 forms of play value! TOSS IT... across the room! GRAB IT... and try dangling it in your cat's general direction! NIPPITY-DO-DAH DAY... Zoom Around the Room organic catnip has been added for maximum kitty Frenzy! 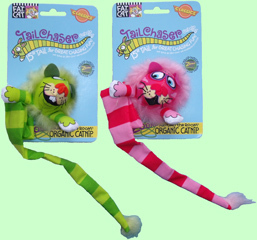 Tail Chasers have a 15 inch long tail.